Mar 1 – Growing Worlds: Turning Your Stories into Games. Melbourne. Organising, panel and interviewing. The recent emergence of games as a storytelling platform is extending the familiar narrative family of books, plays, film and television. The next generation of games will rely on story, narrative and character development to immerse users inside the experience and allow them to live the story. Come and hear award-winning novelist, TV and games writer Matt Costello talk about the key ingredients of planning, writing, designing and structuring a compelling game, referring to the types of stories and characters best adapted from other media. Mar 3 – Broadband and Beyond. One day high power conference on models and Visions for Market Growth, Innovation and Profitability. Speaking on Convergence with the likes of Apple’s Steve Wozniak, Senator Stephen Conroy and CEOs of Fairfax, ABC TV and Hutchinson. Apple co-founder Steve Wozniak is the keynote speaker and will be joined by Senator Stephen Conroy, Minister for Broadband, Communications and the Digital Economy and a host of other international and local speakers who have been selected to provide the Australian audience with a robust and varied perspective on the converging communications environment. Together they will explore, debate and explain future trends, business opportunities, the impact of climate change and green technologies on the communications industry; world’s best practice and global trends in broadband services. The theme of the conference is Models and Visions for Market Growth, Innovation and Profitability which include: a) Convergence: What it will deliver and who benefits. b) How high bandwidth helps reduce greenhouse gas emissions. c) Odd coupling in a digital era: or how broadband is creating new and unlikely business alliances. Social virtual worlds can be foreign to many and the benefits of building a profile or a full-on brand experience within those virtual worlds may not even be considered as part of the marketing plan. If youÃ¢Â€Â™re not sure how social virtual worlds can be beneficial for branding then join us for a basic look at the opportunities. WeÃ¢Â€Â™ll begin with an overview of virtual worlds, how to approach them for the first time, and how to create and develop a personality or character within the world. Gary Hayes will outline the steps taken to launch his clients into these worlds such as ABC TV, BigPond and Fortune 100 companies and the value they have received. YouÃ¢Â€Â™ll also hear Laurel Papworth’Â€Â™s experience as a user and insights as she outlines her views on what brand opportunities are available. Finally youÃ¢Â€Â™ll hear a case study from Tennille Wong on how IBM.com.au successfully used a virtual world as a research medium. Social Virtual Worlds definitely have a place in the digital landscape and if youÃ¢Â€Â™re interested in learning how to get involved, this is the session for you. Mar 13 – Our Space: Asia Pacific Online. Sydney. Part of a global Australian Department of Foreign Affairs and Trade conference. A final keynote Ã¢Â€ÂœOverview of Virtual Communities: Life in the Virtual SpaceÃ¢Â€Â looking at the economic, social and regulatory aspects. Life in the Virtual Space. This session will examine the emerging phenomenon of social virtual worlds that to a great extent now mirror our real world. Special attention will be paid to explaining both the community and economic implications of these online multi user virtual environments (MUVEs), their increasing popularity in Asia, and how such customisable environments can be used for communication, education, business, product development and many forms of activism. Virtual worlds, games and social networking applications will converge with the progression of web 3D and open social platforms. A panel of experts will discuss the evolution of online games from product to media and what this means to the media and advertising industries. Speakers are: David Edery – Worldwide Games Portfolio Planner for Xbox Live Arcade Janet Carr Ã¢Â€Â“ Series Producer, Good Game, ABC Gary Hayes Ã¢Â€Â“ The Project Factory. Jean-Marie Guitera Ã¢Â€Â“ Subversive Games. Mark Fordham Ã¢Â€Â“ Electronic Arts. David Kainer – Viva La Mobile. Come along and participate in the conversation and enjoy complimentary drinks to toast the first AIMIA NSW Intimates event for 2008. The conversation will take a look at: How companies are already trying to capitalise on the new business opportunities that are opening eg. GoogleÃ¢Â€Â™s next frontier Ã¢Â€Â“ TV and in-game advertising. The trends the game developers are incorporating into their new games. Monetising the new medium and where the advertising opportunities will be, such as Ã¢Â€ÂœAdvergamesÃ¢Â€Â. The role online gaming will play in Web 3 technologies. The strategic choices about business model innovation as online gaming boundaries blur. The drivers of the online gaming evolution, such as new consumer behaviour and the technologies, (Euphoria, Digital Molecular Matter). Apr 7-11 – Milia. Cannes, France. Speaker and organising panelist on Ã¢Â€ÂœSocial Virtual Worlds meets TV: The Mixed Reality Perfect StormÃ¢Â€Â. Ã¢Â€ÂœWhere Social Networks meet Games meet TVÃ¢Â€Â. Which side of the wall are you on? TV and Film OR Games and Virtual Worlds? That wall is about to crumble. This is a wake up call to all entertainment producers and consumers to prepare for an almighty collision. Audiences are already spending up to four times as much of their entertainment time in virtual spaces than they are watching TV and there is a growing tide of shows from virtual worlds which mirror our experiences in the physical world. This exciting afternoon panel will examine a wide range of cross-over services that work between games, virtual worlds and linear TV. This seminar is intended for film and TV producers looking to merge their entertainment worlds. Jun 25 – Law & Regulation of Virtual Worlds. Melbourne. (Run through Monash Univ). 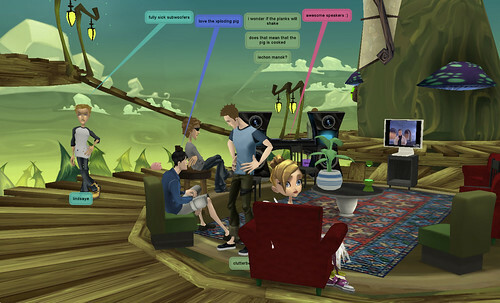 Businesses, and communities of users are increasingly operating in virtual worlds, such as Second Life. But doing business in virtual worlds raises many complex, novel legal issues. In two days time the latest Mark Burnett show, I blogged about in April ‘Alternate Reality TV‘ , will begin. I think this programme will start to blur the line between pure reality TV and the immersion afforded by alternate reality game type quests across media. Much of this seems to be primarily designed to drive eyeballs to AOL and Mark Burnett Productions’ properties and of course the associated advertising that drives sustainability in this emerging media market – here is an article pointing out the heavy weight brands getting behind this from BigCharts. As to the show itself here, as the reality blurred blog points out, is the ‘knockout’ format of the show itself which is pretty simple. Twelve sets of 12 clues will be delivered over the 13 part series across TV (shows such as the Early Show, Survivor Cook Islands) and across online sites, presumably many on AOL, who is the shows main co-production partner. You work out the cryptic answer and then apply online. The first three (from anywhere in the world – could be you or me or a team) who get the answer, will be flown to the US to take part in the first treasure hunt for $100 000 in gold buried in the US somewhere. Cameras will follow, and vlog like 3-5 minute clips will appear regularly on AOL. Each of the 12 winners of each of the above will then be brought back to LA to compete for the big $1 million prize – again gold bullion buried somewhere in the US. Simple really but I wonder if the mass viewer population can also take part in also working out the clues that the chosen three entities are faced with? If not then the distributed cross-media clue element is really just a greed-carrot, part of a selection process that leads to a traditional reality tv show – albeit delivered via the web. Wired also talked about Mr Burnetts foray into games via TV and web in its article Who Gets Games? This looked at the challenge now for traditional TV and Film format developers who have to think more and more at a game level, and game environment design level – making the rules easy and the challenge a lot harder than those dreadful money printing, TV/phone-in/SMS ‘joke’ questions, presumably aimed at an audience easily hoodwinked. Here is an excerpt that compares Survivor with World of Warcraft! But this human tension wouldn’t exist without the game — the complicated and beautifully tuned rules that govern the world of Survivor . Much like the designers who crafted World of Warcraft or Monopoly , Burnett had to create a system that was hard to master, but not impossible. By interposing tests of skill and endurance with the occasional bolt of blind luck, Survivor forces its players to constantly headgame each other and engage in poker-class bluffing: Prime-time game design. “Nobody talks about it on this level, but that’s what I do,” said Burnett, nattily dressed in a tieless pinstriped suit. I met him at Trump International Hotel when he came through town to talk about Gold Rush . While tweaking Survivor , he closely studied John Nash’s game theory in order to better engineer the hysteria and emotional blowouts of each season’s finale. I suppose Goldrush is a step in the right direction at least, combining TV and the web in a more integrated cross-media way (rather than superficial and in-appropriate cross-referencing). Mark B must take control of the ‘game’ at some point to be able to produce a compelling narrative of sorts but I wonder how many individuals will take it upon themselves to try to get to the gold before the officially selected teams? If they do and break the constructed story arc, now that would really be reality TV.